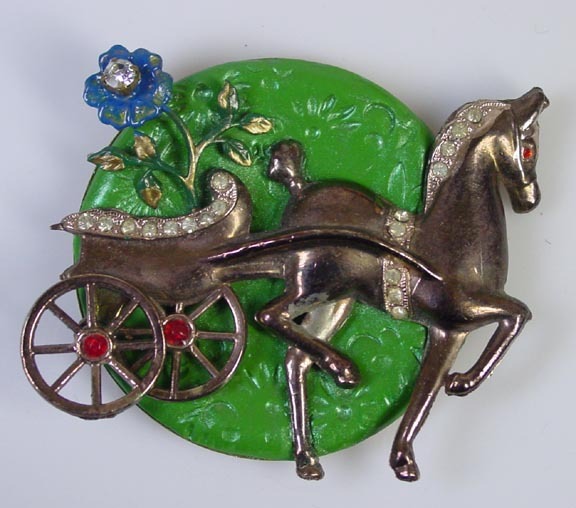 This brooch started with the fabulous vintage broken horse & cart. The green ploymer clay background has an all over floral impressed design with metallic glaze. A cold enamel painted vintage posey added for color and accent. Measures 2 3/4" across. This festive owl was a sad little girl... missing her big stone belly, eyes and with most of the gold tone gone. 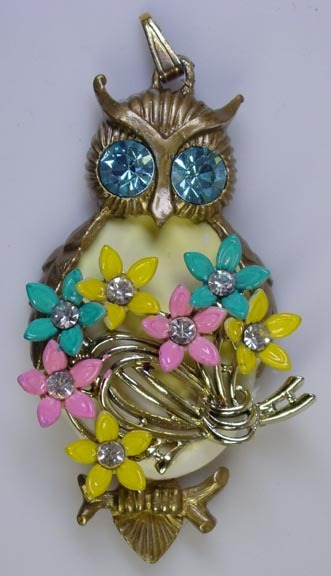 I painted the owl with gold cold enamel and all the flowers in pastel colors. Replaced all the missing rhinestones and added a pale yellow and white swirl polymer clay body. She is now ready to brighten the summer wardrobe! Measures 3" long. Here is a dazzling little fellow from the pale yellow and blue swirl polymer clay background to the two vintage pieces for the "shell". 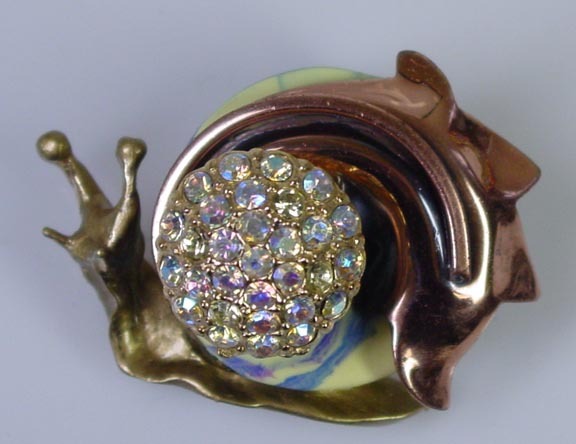 The copper piece gives the shell a definite flair and with the Aurora Borealis encrusted buttom- what flash! Snail body is painted with gold cold enamel. Measures 1 3/4" across. 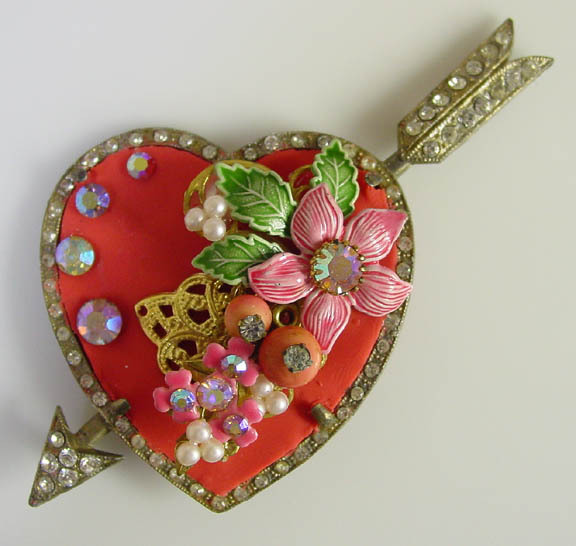 Vintage "frame" is by H.Pomerantz Inc. N.Y. Brooch was missing the large heart shape stone and most of the little rhinestones. 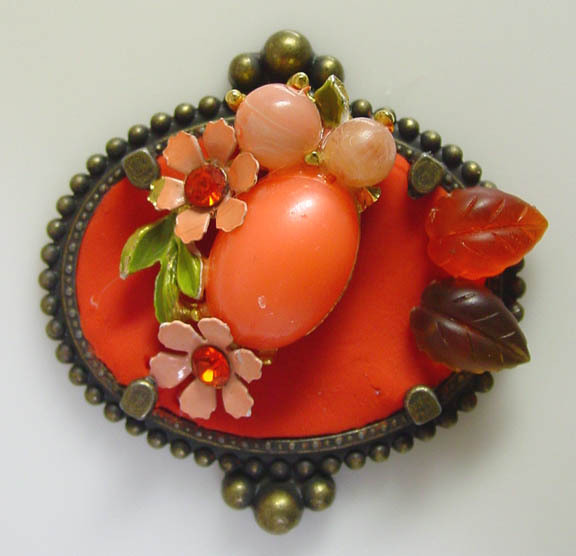 I used Sunset Coral Polymer clay for the background and a fabulous floral vintage piece as a focal point. Added some Aurora Borealis rhinestones and here is a bold, yet feminine brooch. Measures 3 3/4" across. This is a true old Art Nouveau brass brooch with the "C" clasp. The huge center stone was missing, so I added a pale pearl pink polymer clay leaf shape and vintage pink rhinestone piece to compliment the Art Nouveau style. The two original rhinestones are inverted (points up). Measures 3" across. From the blue and purple marbled polymer clay background to the 2 vintage pieces, this is sure to please all flights of fancy! Sweet little bird, freshened up with new old stock rhinestones and cold enamel paint. The floral piece has Moonglow, MOP, rhinestones and faux pearls. Very colorful and dimensional! Measures 2" across. Chunky bracelet with a marbled tomato and orange polymer clay "cabochons". Each cab has 3 new old stock Czech light blue rhinestones. Since each cabochon is hand created, no two are alike. The silver bracelet is quite ornate and measures 7" long x 1 5/8" wide! 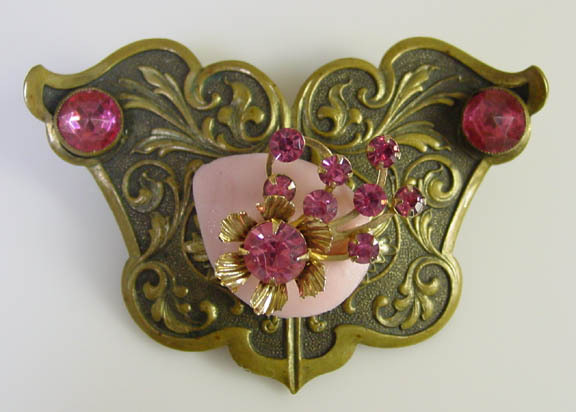 Large and glitzy vintage brooch. This beauty was in sad shape-- missing the center piece and lots of rhinestones. Now with the pale pearl pink polymer clay, added vintage flower piece, replaced rhinestones and pink cold enamel paint around the edge, this is a real eye catcher! Measures a large 4 1/2" across. 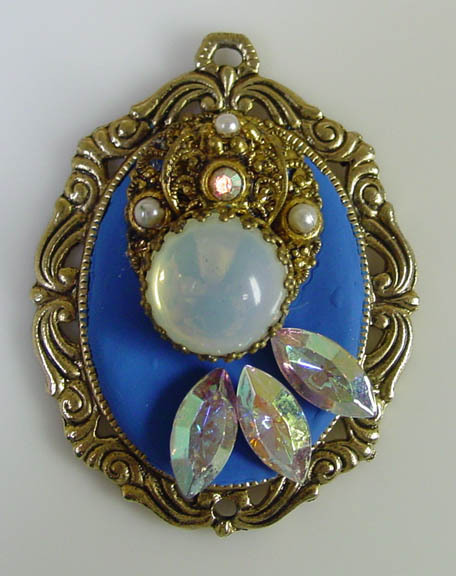 The vintage filigree piece with an opalescent glass stone makes this an elegant pendant. French blue polymer clay and Swarovski Aurora Borealis rhinestones adds classy touches. Just needs a chain and ready to go. Measures 2 1/2" long. The vintage flower brooch is by Coro, but was missing the inside- pearl? I took a pale pearl blue polymer clay and shaped it to the petals, added a vintage piece with 4 different shades of blue. 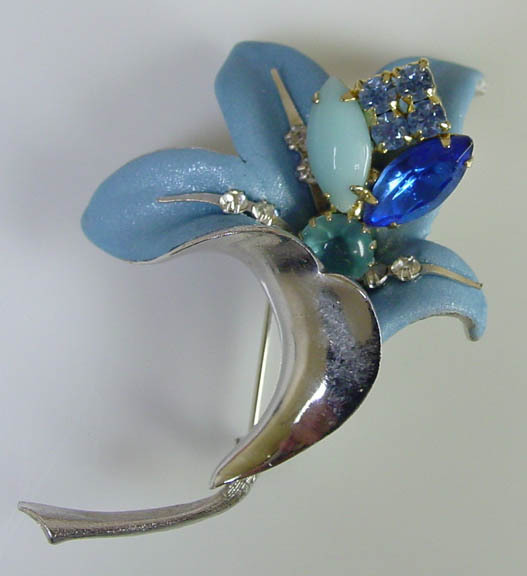 The "veining" of the petals are slender rhinestone components... a striking blue lily brooch! Measures 3 tall. This chatelaine brooch has 3 vintage pieces all with amethyst rhinestones. The polymer clay background is the palest of yellows with white swirls. 2 light amethyst Swarovski pear crystals and a hand created clay rose for added accents. Each jeweled end measures 1 3/4" long and the chain is 7" long, plenty of length for sweater, or ends of collar. Dainty pin will be a bright spot on any outfit! Background is a marbled light avocado and yellow polymer clay. The vintage piece has pastel colors of citrine, blue and green rhinestones. Dangling vintage glass crystals match the the citrine yellow. Measures 2 3/4" long. Fashion can be fun! 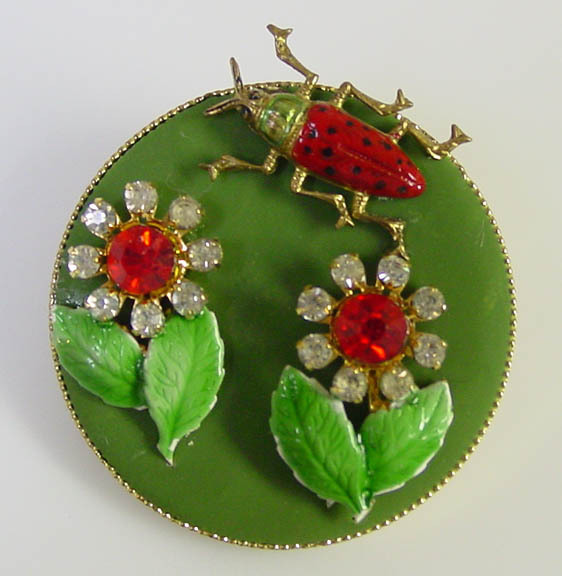 The vintage flowers have reddish orange rhinestone centers surrounded by crystal rhinestones and green enamel leaves. Little bug needed enameling touch up-- red with black dots of cold enamel paint. All on an avocado green polymer clay background. Measures 1 1/2". The pink polymer clay is "puffed" to form to the heart shape. 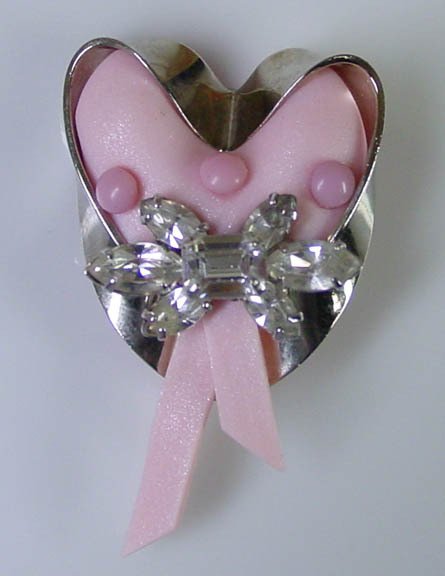 Vintage rhinestone bow piece with 3 pink milk glass "buttons" and "ribbon" streamers. Measures 2 1/4" tall. The polymer clay background is a rich blue with tiny metallic bits... it really makes the vintage Sterling flower pop! Clay has an impressed floral design with sparkling crystal rhinestone centers and the Sterling flower has a light sapphire colored glass stone. Measures 2 7/8" across. 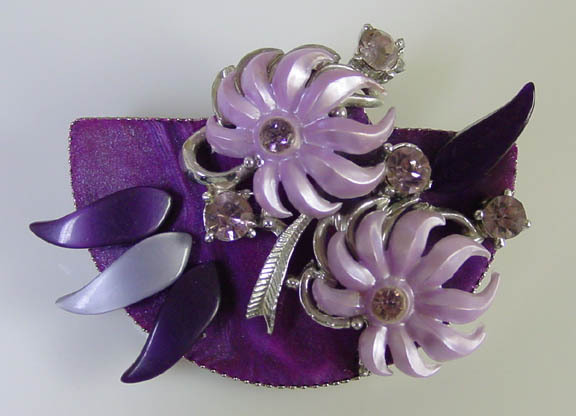 Vintage lavender flower piece was part of a larger brooch by Star. The flower petals are plastic with most broken (only this piece had complete flowers). The polymer clay background is a vibrant purple with pearlized plastic pieces for accent... the 6 light amethyst rhinestones add the sparkle. Measures 2 1/4" across. Many shades of orange... from a pale peach to the deep polymer clay background makes this a vibrant brooch. 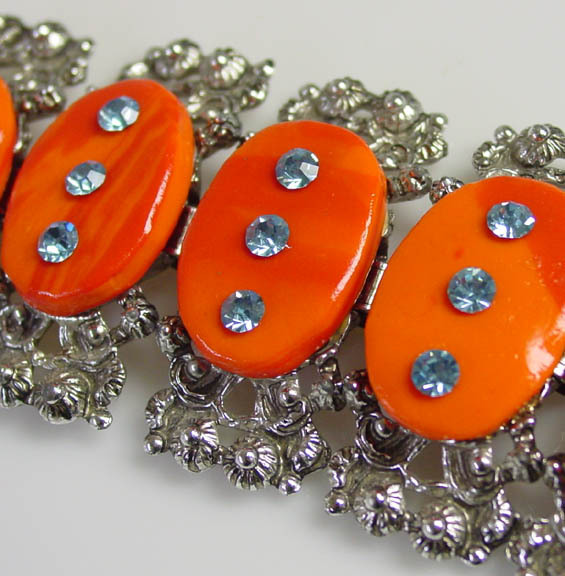 The vintage piece has enamel flowers, plastic beads, cabochon and orange rhinestones. Two vintage glass leaves accents, all in an antiqued brass frame. Measures 1 7/8" across. The flowers are from 2 different vintage pieces with chipped enamel. Now they are brightly colored with cold enamel paint and placed on an aqua polymer clay background. The ornate gold tone brooch frame adds the touch of elegance. Measures 2 1/2" across. Deep, deep purple polymer clay background impressed with a floral print. The vintage piece is a stunner! !-- red rivoli surrounded by red Aurora Borealis and two ruby marquis rhinestones. 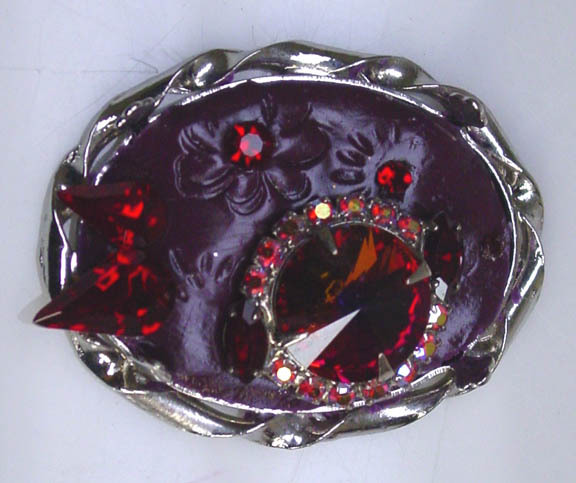 Ruby Swarovski pear shape rhinestones just adds to the rich beauty of this brooch. Measures 2" across. Spring is here now, but the autumn season will be back and this brooch is perfect in color and design for any fall wardrobe. 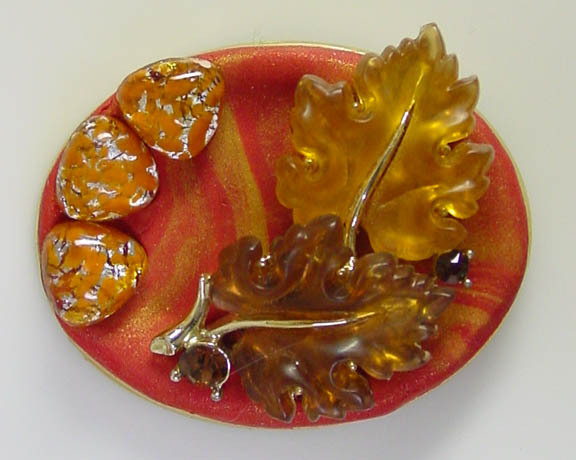 Vintage piece has two leaves of translucent Lucite on a swirled background of red and gold. Three old-new stock of confetti cabochons adds to the overall fall color scheme. Measures 2" across. Glitz is a many splendored thing, especially in this necklace. 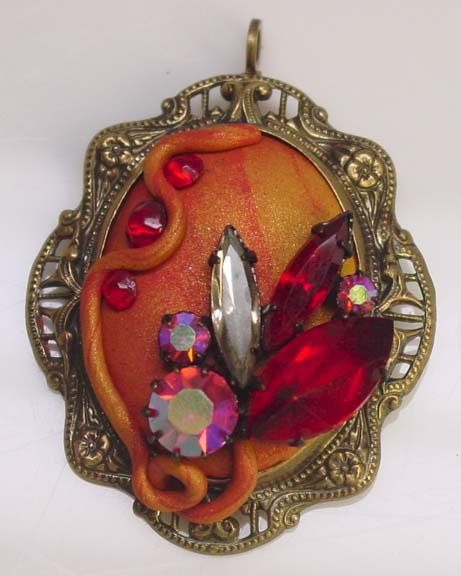 Long, slender curved vintage piece in encrusted with Aurora Borealis rhinestones on a glitter red polymer clay background. Also has an old Aurora Borealis button and 3 red AB rhinestones... truly eye catching! Pendant measures 3 1/4" long, chain is 24". Gold tone Art Nouveau scrolling leaf frame with light blue Swarovski pear shaped crystals. The vintage leaf has 7 light blue Swarovski crystal dangles. Golden polymer clay background with vintage crystal rhinestones scattered about. Measures 2 1/2" across. Rich golden polymer clay background with vintage floral spray of topaz rhinestones and enameled leaves. Swarovski topaz "channel set" rhinestones with two topaz pear shape and one slender navette. Measures 2". For the nature lovers- Thistle branch on a Christmas Tree. Silver tone thistle stamping on a pale pearl green polymer clay background. Vintage Austrian rhinestones with a vintage crystal dangle. Measures 3 1/8" long. Ring came up with.. it�s perfect for this pendant/brooch. of gold and red, a lovely combination for the vintage Japanned piece with ruby and aurora borealis rhinestones. The brass frame just adds to the drama. Judi won the pendant for the 2007 Jewelry Ring Artisans Mall contest. 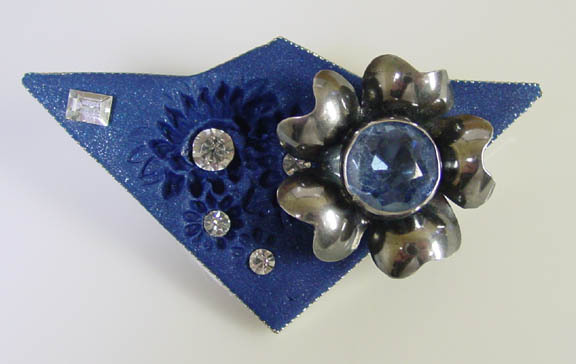 This brooch has cascading vintage rhinestone components on a Cadet blue polymer clay background and ornate silver frame. Joy won the brooch for the 2008 Jewelry Ring Artisans Mall contest. Frosty Blues Brooch Long slender abstract brooch with pearl blue clay. 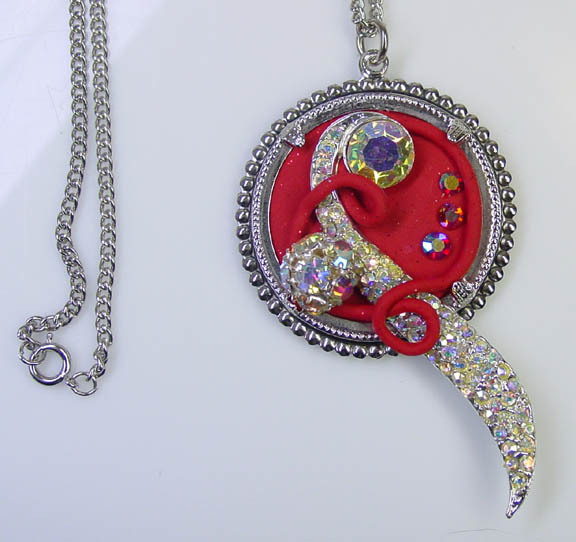 The focal point is the vintage rhinestone piece -- with frosted and crystal rhinestones. 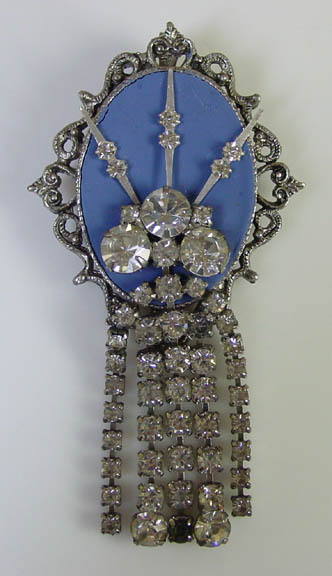 The large kite shape rhinestone in a silver tone filigree dangle adds to the long lines of this brooch. Measures 4 1/4". Ahhhh the drama of this brooch -- one side is a wonderful vintage crystal rhinestone piece, the other is filled with lavender polymer clay roses, all on a lavender background. Will add much glitz and glamour to any outfit! Measures 2 1/2" long. Gold tone grape frame with vintage blue aurora borealis rhinestone component. Olivine and royal blue vintage glass rhinestones on a sage green polymer clay background. 3 leaves dangling on chains. Measures 3 1/4" across. Perfect for the glitzy holiday season. Brooch has pale leaf green pearlized polymer clay background with a vintage crystal rhinestone snowflake and dangle. For extra drama are the three vintage milk glass marquis stones and round green tourmaline rhinestones. Measures 3 7/8" long. A commission piece for a very special friend in memory of her husband and true love. 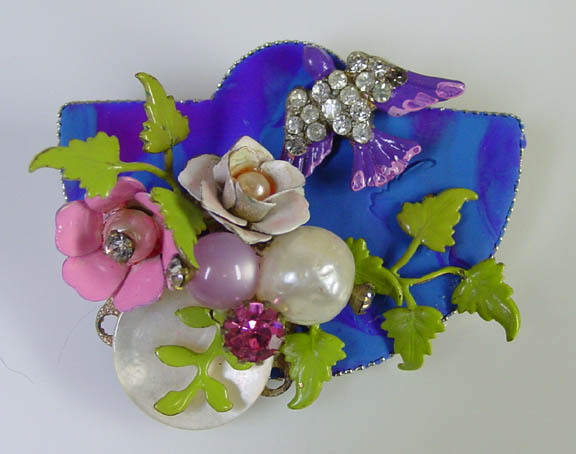 A newer hummingbird component with a vintage piece consisting of a pink moonglow bead, pearl, rhinestones and enamel leaves. Add lots of glitz to any wardrobe with this Christmas Tree brooch. The crystal flower piece and dangle are vintage with Swarovski rhinestones in crystal and ruby -- all on a pale pearl green polymer clay background. Measures 3 1/2" long. Pale yellow polymer clay background with a vintage swirl component loaded with Turquoise and Montana blue rhinestones. 3 light aqua navette rhinestones and Montana blue rhinestone chain of Swarovski crystal rhinestones -- all with a little Art Deco flair. Starting with the vintage bow pin, along the golden oval drop and a garnet enamel vintage piece� this piece is all glamour. Added are vintage crystal rhinestones. Brooch measures 2 1/2". Light pearl blue clay background with 2 vintage art glass and blue aurora borealis rhinestone jewelry pieces. 2 vintage kite shape crystal rhinestones with aurora borealis and blue crystal dangles. Brooch measures 2 3/8�. Contemporary Sterling heart with turquoise, coral and onyx on a pale pink/silver polymer clay background. Swarovski jet and turquoise rhinestones are added accent. Measures 2 7/8" across. Art Deco in Teal Brooch Vibrant teals and blues on a buttery yellow background. The vintage button has large teal rhinstones and circled with Swarovski crystal rhinestone chains. 3 teal Swarovski pear shape rhinestones with a gold tone filigree add the Art Deco flair. Measures 2 7/8" across. This was a commission piece � a dainty little oval brooch with purple polymer clay background and a vintage engraved heart locket (locket opens and will hold your favorite photo).